The crack-of-dawn blender user, the late-night AC/DC listener, the dog that barks at falling leaves. If you’ve lived in an apartment, you’ve probably dealt with a noisy neighbor. Sometimes it’s easier than others to pop in earplugs and go back to sleep. However, apartment life doesn’t mean you constantly have to sacrifice your serenity and relaxation to accommodate those living around you. 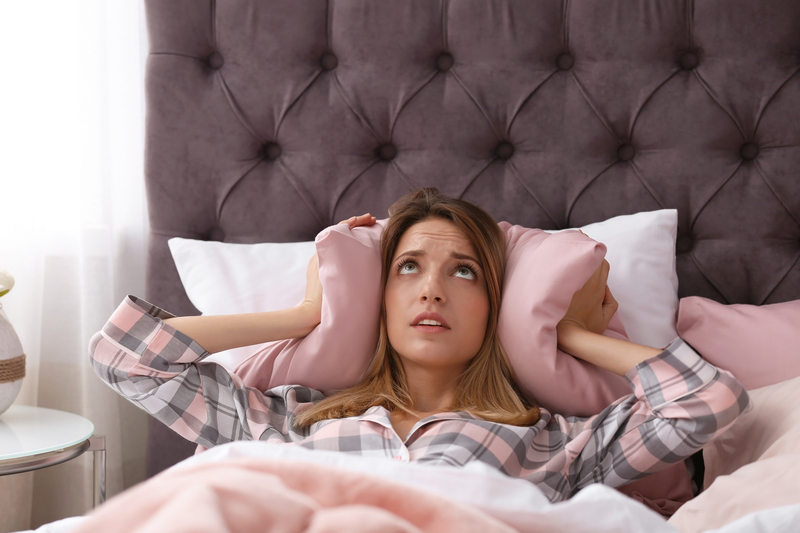 The following ways to deal with noisy neighbors and other essential apartment living hacks can help ensure your apartment is the sanctuary you’ve been seeking. The quest of creating a comfortable apartment environment begins before moving into your space. Ask the landlord or leasing agent about which floors or areas of the apartment complex are the quietest, and inquire about any recent noise complaints. Higher floors tend to be quieter than lower floors. Communication is key to understanding your neighbors and coexisting in an apartment complex with minimal issues. Neighbors are typically unaware that they’re disturbing someone, so before consulting the landlord, speak directly to your neighbor about what’s bothering you. Ask for a phone number, so you can text him or her if the noise is too loud. Sometimes neighbors are not as neighborly as we’d like, and complaints must be brought to the landlord for action to be taken. Many times, there are bylaws or lease clauses that allow your landlord to take more formal measures against the noisemaking. This way, the noisemaking is documented. If it continues, you may ultimately watch a new, hopefully quieter, neighbor move in. Apartments are typically smaller than most single-family homes, but that doesn’t mean you have to sacrifice comfort or convenience. Save space by using over-the-door storage racks, hooks and even risers to create storage space underneath your bed. Think about creating more vertical space when horizontal space is limited. Renting an apartment usually means you don’t want to dump a lot of money into the space that you won’t get back when it’s time to move. Fortunately, there are a lot of ways to upgrade your space with budget-friendly items or those that you can take with you. You may not be able to update the entire bathroom, but you can purchase a new showerhead to make your shower more enjoyable. If you’re interested in a bigger upgrade, ask your landlord for a discount on rent for major improvements. The landlord will often agree, because upgrades will allow him or her to increase rent for future tenants. Similar to upgrading certain areas of your apartment, you can take several energy-conserving measures to reduce power use and save money. Items as simple as window shades and LED light bulbs can save you a substantial amount of money each month — which can be used toward anything you please, including rent. A programmable thermostat can also guarantee you’re not using an unnecessary amount of heat or air conditioning when you’re not home. Living in an apartment doesn’t have to be a struggle. Communicate well with your neighbors and landlord, make optimal use of your space, and upgrade items that will improve your daily life — and you’ll quickly see how easy it is to thrive in an apartment setting.